In the main bar area there are six powered QSC K10, 10-inch two-way speakers yoke-mounted high along the walls and either side of the 25-foot automated drop-down projection screen. 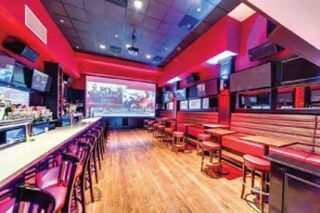 AVNY, established four years ago, serves hotel, restaurant, and nightclub clients, and recently completed a project at O’Neill’s in Maspeth, Queens. The firm is also working on a 9,500-squarefoot club/lounge in Brooklyn called Den Brooklyn, and a two-story outdoor venue overlooking the Hudson River on Manhattan’s Upper West Side. The new multi-million-dollar megapub, which occupies three floors and a mezzanine, includes two full-service bars, a separate wine bar, and a VIP room. The venue features QSC K Series active loudspeakers and AcousticDesign in-ceiling loudspeakers driven by RMXa Series amplifiers throughout, delivering larger-than-life audio quality experience to match the two massive projection screens and numerous flat-screen HD displays installed throughout the venue. “In the large entranceway we used QSC powered K8 eight-inch two-way speakers and the powered dual-12-inch KSubs built into the wall in order to deliver the initial ‘wow’ factor,” Kral reported. AD-52st ceiling speakers paired with AD-81tw ceiling subwoofers, powered by RMXa amplifiers, help recreate the atmosphere of the entrance tunnel into the stadium. Kral installed the same complement of QSC speakers that is in the main entranceway in the hallways on the three upper levels. In the main bar area there are six powered K10, 10-inch two-way speakers yoke-mounted high along the walls and either side of the 25-foot automated drop-down projection screen. Four KSubs are hidden in the bar and tiled columns below the four 52-inch HDTVs. “The K Series loudspeakers deliver an aggressive full-range, high-fidelity sound that meet our demands perfectly,” said Kral, who used the same loudspeaker complement in the venue’s other viewing rooms.